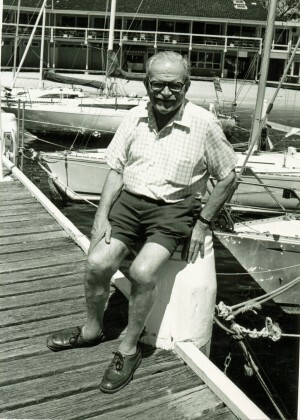 Commodore of Middle Harbour Yacht Club 1982 to 1984. He was the driving force behind such notable events as MHYC's Sydney to Suva Yacht Race in 1976, 1978, 1980 and 1982. Geoff was one of MHYC's earliest members, joining in 1962 (39 years). He started in the Manly Juniors 40 years ago at the Clontarf Junior Sailing Club, an off the beach club run by Peter Green. His fondest memory was joining the Frank Likely crew who he says was a born yachtsman, a superior racer and did so much for our club - "Frank won lots of races simply due to his ability". Said Geoff. Geoff's first yacht was a 24' Vanderstat that he called Senyah (his wife Peggy's maiden name spelt backwards). Next was a Nickelson 32' and then a Vanderstat Sprinter 34'. In fact, all his boats were called Senyah. Geoff was a very successful competitor, a three times winner of the Ampol Tasman Sea Trophy. This trophy was for the overall Pointscore in 3 ocean races - Montague, South Solitary and the Sydney to Brisbane race (you had to be dedicated). The Sydney to Mooloolaba Yacht Race evaded his grasp, finishing second and third respectively. It is interesting to note that the Mooloolaba race was the first yachting sponsorship in Australia and then competitors couldn't wear an Ampol badge or they would be labelled as professional so they could not compete in the Olympics. My, how times have changed. He competed in the Brisbane to Gladstone Race in the year that a cyclone hit and had had to pull out. Peter Hopward won in Harmony, a 32' Swanson, and then Geoff bought Harmony from Peter. In 1974, the CYCA ran the inaugural Sydney to Noumea Yacht Race so Geoff entered and came 2nd. This race was run every second year, so MHYC decided to run a different race on alternative years - to Suva. There were 4 races to Suva, the first 2 without a sponsor and the next 2 were sponsored by Toohey's & Co. - unfortunately that ceased when Fosters took over Toohey's. 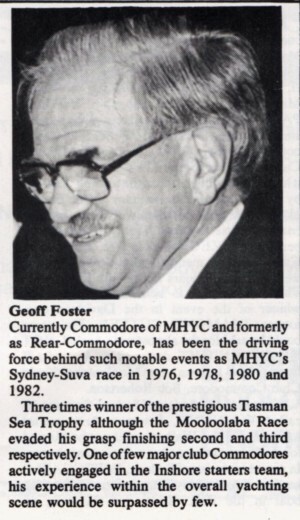 In 1975 Geoff retired and devoted his time running races at MHYC. At the time, Geoff was one of the few major club Commodores actively engaged in the Inshore starters team. His experience within the overall yachting scene would be surpassed by few. For many years, he was also editor of the LOG (MHYC newsletter).